In anaerobic environments where inorganic electron acceptors, such as nitrate, Fe(III), Mn(IV), or sulfate and sulfur, are limiting complex organic matter is decomposed to methane and carbon dioxide as main products (Stams and Plugge 2009). This involves a series of sequential conversions performed by communities of fermentative anaerobic bacteria and methanogenic archaea. Anaerobic bacteria degrade the organic compounds to products, typically hydrogen, carbon dioxide, formate, and acetate, which are the main substrates of methanogens. When organic matter is completely degraded, about 60–70% of the methane is formed from acetate, the remainder from H2 + CO2 and formate. This shows the quantitative importance of acetate in the formation of the hydrocarbon methane. The fate of acetate in a methanogenic environment is largely dependent on the chemo-physical conditions, such as temperature, pH, salt, and presence of inhibitory compounds, e.g., ammonium. At circumneutral pH and at low or moderately high temperature, acetate is directly degraded by methanogenic archaea. Just two genera of acetotrophic methanogens, Methanothrix (former Methanosaeta) and Methanosarcina, are able to grow on acetate. Syntrophic acetate degradation can occur as well. This is particularly important at conditions where acetotrophic methanogens cannot grow well, which is typically the case in environments with a high ammonium concentration, high temperature (above 60 °C), and high salt/high pH. The first observation of syntrophic acetate oxidation was done by Zinder and Koch (1984). They enriched a culture with acetate at 60 °C and obtained a coculture of a bacterium and a hydrogenotrophic methanogen. Syntropic conversion was further demonstrated by using labeled substrates. Acetoclastic methanogens split acetate to methane and CO2, where the methyl-group yields methane and the carboxyl-group CO2. During syntrophic acetate oxidation, both C-atoms of acetate are first converted to CO2 and the methanogen uses the formed CO2 to produce methane. Consequently, during syntrophic acetate oxidation labeled methane is formed when unlabeled acetate and labeled CO2 are provided. This strategy was regularly applied to demonstrate syntrophic acetate oxidation in other environments, e.g., in environments with ammonium concentrations that are inhibitory for acetoclastic methanogens (Schnürer et al. 1999). The two known acetotrophic methanogenic genera are Methanothrix (“Methanosaeta”) and Methanosarcina. These two genera belong to the order Methanosarcinales within the archaeal kingdom Euryarchaeota. Described mesophilic and thermophilic Methanosarcina species include, M. barkeri, M. mazei, M. acetivorans, M. baltica, M. frisia, M. horonobensis, M. lacustris, M. semesiae, M. siciliae, M. soligelidi, M. vacuolata, and M. thermophila. Methanothrix species include M. soehngenii, M. concilii, and M. harundinacea, which are mesophiles, and the thermophiles M. thermoacetophila and M. thermophila. The synonym for Methanothrix is Methanosaeta. Based on a long-standing discussion, the most recent opinion of the International Committee on Systematics of Prokaryotes (Tindall 2014), Methanothrix is appropriate and this name is used throughout this chapter, though Methanosaeta is most-often used in publications of the last decade. In pioneering studies by Nicolaas L. Söhngen and later by Horace A. Barker, sarcina type methanogens were enriched (Söhngen 1906; Barker 1936). The first pure culture of Methanosarcina barkeri was obtained by Schnellen (1947), and since then many mesophilic and thermophilic Methanosarcina species have been isolated and described. Methanothrix soehngenii was first described by Huser et al. (1982) and later Methanothrix concilli was described (Patel 1984). Based on a comparative analysis of Methanothrix strains, it was concluded that M. concilli is a synonym of M. soehngenii (Touzel et al. 1988). As the M. soehngenii culture was not pure, its name was found not be valid according to rule 31a of the International Code of Nomenclature of Bacteria stating that “the name of a species or subspecies is not validly published if the description is based upon studies of a mixed culture of more than one species or subspecies” and Methanosaeta concilli was proposed as the type strain of filamentous acetoclastic methanogens (Patel and Sprott 1990). Similarly, a thermophilic acetoclastic methanogen had been described, Methanothrix thermoacetophila (Nozhevnikova and Chudina 1985). However, as that name was never validated and the culture turned out not to be pure also that name was considered not to be valid, and Methanothrix thermophila was described by Kamagata et al. (1992) to represent thermophilic acetoclastic filamentous methanogens. That archaeon was proposed to be named Methanosaeta thermophila (Boone and Kamagata 1998), which was approved by the International Committee on Systematics of Prokaryotes (Tindall 2008). However, recently both Methanothrix soehngenii and Methanothrix thermoacetophila were reestablished as valid names based on a changed view of the interpretation of rule 31a, “the name of a species or a subspecies is not validly published if the description is demonstrably ambiguous and cannot be critically identified for purposes of the precise application of the name of a taxon” (Tindall 2014). Methanosarcina and Methanothrix are morphologically and physiologically different. Morphologically, the sarcina-shape and thix-shape are represented in the genus names. The cell wall structure of the two types of methanogens is also different. As most methanogens, Methanosarcina and Methanothrix contain S-layers which are mostly composed of a single protein or glycoprotein which is associated with the cytoplasmic membrane (Albers and Meyer 2011). The cell wall of Methanosarcina contains methanochondroitin, which is a fibrillar polymer composed of a trimer repeat of two N-acetylgalactosamines and one glucuronic acid. Its formation is associated with the aggregated form of Methanosarcina (Kreisl and Kandler 1986). Methanothrix concilii has a rather complex cell envelope. The filamentous chains are enclosed by a unique tubular paracrystalline proteinaceous sheath surrounding the S-layer and the cytoplasmic membranes. Physiologically, Methanosarcina and Methanothrix show interesting differences. Methanosarcina has a broader substrate range. Besides acetate, Methanosarcina species can grow with H2 + CO2, methanol and methylated amines. It can be considered as a generalist. Methanothrix is a specialist that only uses acetate as growth substrate, though as discussed later it also has the ability to convert CO2 to methane, without the involvement of hydrogenases. The growth behavior of the two types of methanogens is different. While Methanosarcina shows faster growth, Methanothrix has a higher affinity for acetate (Table 1). The higher affinity has been associated with the enzyme systems for acetate activation (Jetten et al. 1990). The difference in acetate transport was proposed to play a role as well (Smith and Ingram-Smith 2011). The differences in specific growth rate and affinity for acetate make Methanosarcina easily enriched using routine isolation procedures, while Methanothrix is often the most abundant acetoclastic methanogens in environments where a low acetate concentration is observed. Methanosarcina is considered to be a rather robust methanogen in comparison with Methanothrix as it grows faster with acetate and can use other substrates. In addition, Methanosarcina can better resist and recover when exposed to stressors such as ammonium, chlorinated compounds, salt, and high acetate concentration (De Vrieze et al. 2012). In comparison with Methanothrix, Methanosarcina is most resistant to oxygen. Recently, even the cocultivation with aerobic methanotrophs was described (in ‘t Zandt et al. 2018). However, there are examples where Methanothrix seems to be more resistant. Methanothrix is more resistant to long-chain fatty acids (Silva et al. 2016) and humic substances (Azman et al. 2017) than Methanosarcina. The higher tolerance in these cases was thought to be related to the different cell wall structure. In recent years, there is quite some attention for direct electron transfer in methanogenic microbial communities, with or without electron mediators (Lovley 2017; Martins et al. 2018). Acetoclastic methanogens have been described to accept directly electrons provided by another bacterium or a solid surface to produce methane from CO2. Morita et al. (2011) suggested the potential of direct interspecies electron transfer in a methanogenic bioreactor. In an ethanol-fed bioreactor, Methanothrix became the dominant methanogens, and Geobacter the most abundant and metabolically most active bacteria (Shrestha et al. 2013); metatranscriptomics revealed that the Methanothrix species in the digester were highly expressing genes for the reduction of carbon dioxide to methane (Rotaru et al. 2014b). 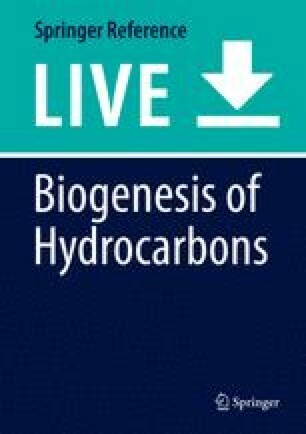 These observations were quite remarkable as Methanothrix is not able to grow with H2 + CO2 and lacks the essential hydrogenases of typical hydrogenotrophic methanogens. In a coculture of Methanosarcina barkeri and Geobacter metallireducens, direct interspecies electron transfer was involved in ethanol conversion (Wang et al. 2016), while in a coculture of M. barkeri and Pelobacter carbinolicus interspecies hydrogen transfer played a role (Rotaru et al. 2014a). Unlike Methanosaeta, Methanosarcina is able to grow with H2 + CO2. Methanosarcina can perform a hydrogen-dependent relationship with other bacteria. When sulfate is present, Methanosarcina can transfer hydrogen formed in the conversion of methanol or acetate to a sulfate-reducing Desulfovibrio (Phelps et al. 1985). Methanosarcina can act as hydrogen scavenger when a Desulfovibrio is grown on lactate without sulfate (Bryant et al. 1977). This shows that Desulfovibrio and Methanosarcina can both act as hydrogen-producing and hydrogen-consuming microorganisms, which makes it an interesting coculture for further genome-based studies (Plugge et al. 2010; Scholten et al. 2007). In anaerobic environments, acetoclastic methanogens may compete with sulfate-reducing bacteria for acetate. Research by Schönheit et al. (1982) showed that Desulfobacter postgatei outcompeted Methanosarcina barkeri for acetate. This was explained by differences in affinity for acetate; the Km values for acetate are 0.2 and 3.0 mM for the sulfate reduce and the methanogen, respectively. However, Methanothrix is often the most abundant acetoclastic methanogen and as explained, Methanothrix has a higher affinity for acetate than Methanosarcina (Jetten et al. 1992). In addition, Desulfobacter is a typical marine sulfate reducer, while in freshwater environments, Desulfobacca acetoxidans is an important sulfate reducer specialized in degradation of acetate (Oude Elferink et al. 1999). The Km for acetate of this bacterium is 0.1–1 mM, which is just slightly lower than that of Methanothrix (Km is 0.4–1.2 mM) (Oude Elferink et al. 1998; Stams et al. 2005). Also the threshold value for acetate consumption of D. acetoxidans is just slightly lower than that of Methanothrix. Thus, Methanothrix will be outcompeted by sulfate reducers, like D. acetoxidans. However, when a bioreactor with methanogenic sludge was fed with acetate and sulfate, it took a very long time before acetate was degraded by sulfate reducers, and it was calculated that it could take 200–500 days before methanogens and sulfate reducers became equally important in the conversion of acetate (Visser et al. 1993). This reflects the small differences in growth kinetic properties of the two types of microorganisms. An interesting feature in this respect is that acetoclastic sulfate reducers have a lower affinity for sulfate than hydrogenotrophic sulfate reducers (Laanbroek et al. 1984). This has important consequences. In environments where the sulfate concentration is not sufficient for complete degradation of organic matter, acetoclastic methanogens are not easily outcompeted and acetoclastic methanogenesis still prevails (Sousa et al. 2009). Methanogenesis from acetate yields little energy. At standard conditions, the Gibbs free energy change of the conversion of acetate to CO2 + CH4 is just −31 kJ/mol, which is much less than the free energy needed to synthesize one ATP; the standard Gibbs free energy change for the phosphorylation of ADP to form ATP is +45 kJ/mol (Thauer et al. 1977). By contrast, the standard Gibbs free energy change of methane formation from 4 H2 + CO2 is −136 kJ per mol. The pathway of acetotrophic methanogens was the subject of several excellent reviews (Ferry 2011, 2015; Schlegel and Müller 2013; Welte and Deppenmeier 2014). Available genome sequences are helpful to refine the insight of the pathways and energy conservation mechanisms. The initial step in the metabolism of acetate is the activation to acetyl-CoA (Fig. 1). Acetate activation in Methanothrix and Methanosarcina is different (Jetten et al. 1990). An acetate kinase/phospho acetyl transferase (AK/PAT) system is used by Methanosarcina species. This enzyme system has a high activity, but low affinity, which reflects the physiological features of Methanosarcina. The low-activity but high-affinity AMP-dependent acetyl-CoA-synthetases (ACS) is used by Methanothrix. The AK/PAT system generates ADP, phosphate, and acetyl-CoA from ATP, CoA, and acetate, while the ACS converts ATP, CoA, and acetate to acetyl-CoA, AMP, and pyrophosphate (Jetten et al. 1990; Berger et al. 2012; Ferry 1992). The pyrophosphatase of Methanothrix is a soluble protein, which makes it unlikely that energy of pyrophosphate cleavage is conserved (Berger et al. 2012; Zhu et al. 2012). Remarkably, membrane-bound pyrophosphatase is present in Methanosarcina. Thus, the activation of acetate in Methanosarcina requires one ATP, while acetate activation in Methanothrix requires two ATP, as ATP + AMP is converted to ADP by adenylate kinase. Genes coding for enzymes in some acetoclastic methanogens are presented in Table 2. As acetoclastic methanogens grow with acetate as sole carbon and energy source, energy conservation mechanism should yield more than one and two ATP per molecule of acetate in Methanosarcina and Methanothrix, respectively. Acetyl-CoA is converted to a methyl and carbonyl moiety by the action of a CO dehydrogenase/acetyl-CoA synthase (Fig. 1). At the enzyme, the carbonyl group is oxidized to CO2 and electrons are transferred to ferredoxin. The methyl group is transferred to a methanogenic cofactor (tetrahydromethanopterin) and subsequently transferred to coenzyme M by a membrane bound sodium translocating methyltransferase. Reduction of the methyl group to methane with coenzyme B as electron donor leads to the formation of a heterodisulfide (CoM-S-S-CoB). In both methanogens, the heterodisulfide is cleaved (reduced) to coenzyme M and coenzyme B with reduced ferredoxin, a process that results in energy conservation (Welte and Deppenmeier 2011; Feist et al. 2006). Methanosarcina barkeri employs an energy conserving hydrogenase (Ech) complex and F420 nonreducing hydrogenase, while M. acetivorans uses an Rnf-like complex (Li et al. 2006; Ferry 2015; Schlegel and Müller 2013). The involvement of these membrane bound enzyme systems results in the formation of an electrochemical gradient (protons, sodium) to drive ATP synthesis (Wang et al. 2011). In the genomes of Methanothrix species, the genes for Ech or the Rnf-like complex are not present (Barber et al. 2011; Zhu et al. 2012; Welte and Deppenmeier 2011). Instead, a multi-gene cluster encoding for a reduced F420 dehydrogenase, which is not present in obligate hydrogenotrophic methanogens, but which is found in Methanothrix and in Methanosarcina, seems to play an important role in the formation of a proton gradient in Methanothrix when grown on acetate. As discussed by Welte and Deppenmeyer (2014), with some assumptions about the number of protons and sodium ions exported, sufficient energy could be conserved for net ATP synthesis. Generally, it is assumed that three protons or sodium ions drive the synthesis of one ATP, but the stoichiometry for methanogens was found to be four (Deppenmeier and Müller 2007). However, the way Methanothrix conserves energy needs further study. Modeling can help in prioritizing which possible explanations may be most likely. One powerful approach is called genome-scale metabolic modeling. Genome scale metabolic models are in essence a computable inventories of all metabolic reactions that the gene products – proteins, i.e., enzymes – of the genome can carry out (Henson 2015). Many bioinformatic tools and databases are available for such a metabolic reconstruction, and also for acetoclastic methanogens such genome-scale metabolic models are made (Feist et al. 2006; Benedict et al. 2012; Hanemaaijer 2016). Knowledge of the kinetic properties of redox enzymes involved in methanogenesis can be used to obtain insight in the physiology and the bioenergetics of acetoclastic methanogens, as discussed above; genome-scale models add a quantitative bookkeeping of all ATP-generating and ATP-consuming reactions in the metabolic network required for growth. Such models can run scenarios that are very difficult to perform experimentally, and in such a way combine molecular and physiological data to test the conditions at which specific hypotheses or stoichiometries are feasible. For example, for Methanothrix concilii, Hanemaaijer (2016) reconstructed the metabolic network and investigated quantitatively which adjustments in the current stoichiometries of acetate activation and membrane pump stoichiometries (protons, sodium) would allow M. concilii to grow on acetate. For example, as a function of ΔpH and specific metabolite levels, the maximum number of protons dissipated per ATP formed can be calculated, which is less than four (and likely more than three). Also if a membrane-bound, proton-pumping pyrophosphatase would be present (or engineered), the minimal number of protons will have to be two (1.8 in the model), again under some assumptions of unknown concentrations that determine the Gibbs free energy changes of the associated reactions. Despite that, in Methanothrix a typical energy-conserving membrane-bound pyrophosphatase is not present, but its ability to contribute to energy conservation is still possible. Welte and Deppenmeier (2014) proposed that pyrophosphate cleavage might be linked to other energy-dependent reactions in the anabolism by which at least partially the energy of pyrophosphate hydrolysis is conserved. In the models, it can be calculated which combination of changes in stoichiometries are feasible and which not, and based on this dedicated experimental validations can be suggested. Genome-scale metabolic models are also often used in biotechnology for strain and process optimization (Branco dos Santos et al. 2013; Gottstein et al. 2016). For acetoclastic methanogens, who seem to live on the edge of thermodynamic feasibility, it is important to integrate thermodynamic constraints based on metabolite levels. Recently, such a genome-scale metabolic modeling approach was developed to understand how microbes, among which acetoclastic methanogens cope with substrate concentrations that prevail in natural environments (Shapiro et al. 2018). Such approaches should in the future be combined with additional cellular constraints based on either resource allocation (Basan 2018) or thermodynamics (Kümmel et al. 2006) to become powerful predictors of growth phenotypes. Two genera of acetoclastic methanogens, Methanosarcina and Methanothrix, have been described. There are remarkable differences between these two genera in terms of morphology and physiology. Acetoclastic methanogenesis is energetically not a very favorable process, but nevertheless, it is very important for complete degradation of organic matter. Research done to understand the metabolism and energy-conservation mechanisms in acetoclastic methanogens showed differences in acetate activation and electron transfer mechanisms. Further genome-based transcriptome and proteome analyses, in combination with biochemical and modeling studies, will shed further light how these types of archaea cope with the energy constraints. Omics information will also help to understand better the interaction of acetoclastic methanogens with other microorganisms and with inorganic materials. 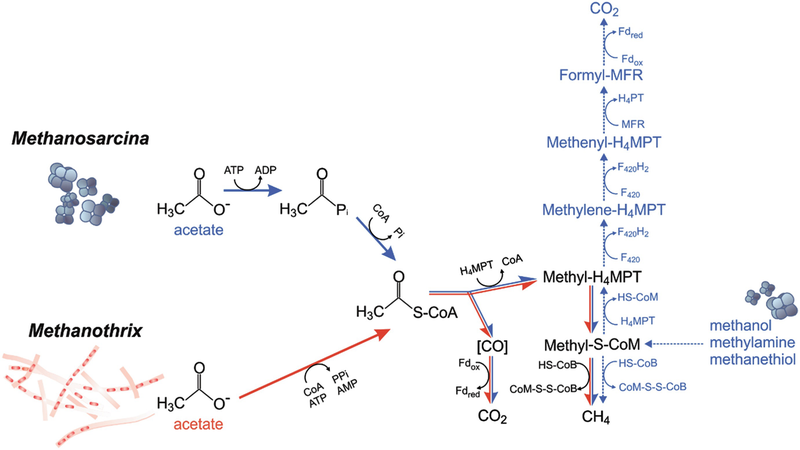 In methanogenic environments, acetate can be degraded by acetoclastic methanogens (Methanothrix and Methanosarcina) or by syntrophic associations of acetate-degrading bacteria and hydrogenotrophic methanogens. Further research is needed to define the exact environmental conditions stimulating direct and indirect methanogenesis from acetate. In-depth genome-based analysis and genome-scale modeling offer the possibility to get further insight of the bioenergetic features of acetoclastic methanogens and to formulate hypotheses that can be tested. To completely resolve the bioenergetic properties of acetoclastic methanogens, physiological and enzymatic studies are needed. Advances in the development of genetic systems in acetoclastic methanogens are still modest, with some successful genetic modification trials of Methanosarcina, but no attempts on Methanothrix. The ability to insert genes and create knock-outs of acetoclastic methanogens will aid the study of their physiology and bio-energetic features. The observation that acetoclastic methanogens are involved in mediated electron transfer (MET), direct electron transfer (DET), and direct interspecies electron transfer (DIET) is intriguing. A better picture of the quantitative importance of electron transfer processes linked to acetoclastic methanogens can be obtained by studying pure culture and defined mixed cultures.